Wright, along with prominent campaigners like Rob Hopkins, the founder of the UK’s transition towns network, have given up the travel drug and operate from their own no-fly zones. On the other hand, other climate change campaigners justify flying in the name of the cause to spread awareness on climate change. These “justiflyers” include Al Gore and Dr. Rajendra Pachauri of the Intergovernmental Panel on Climate Change, and Franny Armstrong, Director of the Age of Stupid. They and others involved in climate change research, policy making and advocacy have received criticism for not always walking the talk. For the United Nations University including the Media Studio, which produces content for Our World 2.0, our mandate is to educate the global public about what is going on in the world. And in doing so, whether it is in accepting students through our courses, partnering with research institutions from around the world or developing educational films and articles for this website, the UNU is responsible for its fair share of emissions from flying. We have to be honest with ourselves and admit that this is a certain irony, given that many of our initiatives relate to climate change. So what to do? If we accept that — for the UNU or other educational and advocacy institutions — international travel can indeed be necessary to achieving valid goals, then the question therefore becomes how to be smart flyers who choose carefully when, to where and for what purposes they fly. Obvious first steps to changing our aviation habits include avoiding trips to shorter meetings or to far-away locations, and instead taking up opportunities to utilise modern technologies, such as video conferencing and Skype hookups. Although video conferencing might appear to be expensive to set up initially — with an entry level system costing around US$ 2,500 and a top of the line system around US$ 20,000 — like efficient lighting or a good education, it’s a wise investment that pays dividends in the long term. That would be equivalent to a couple of those around-the-world business class air tickets. Furthermore, it is fairly easy and intuitive to use and saves the weary traveller from hours of fun at the airport transfer lounge. When it comes to providing education with a global flavour, e-learning provides the obvious win-win solution here. Although it has many definitions, e-learning is basically technology-enhanced learning, which is predominately online or web-based. Today, e-learning not only allows for the instant exchange of information across the world through web based learning management systems like Moodle, but with video conferencing technology, you can see, hear and speak to your counterparts in multiple locations in real time. That means that international learning and collaboration can still take place from the comfort of your own space. Research in the UK has shown that distance learning and e-learning courses have a significantly smaller carbon and energy footprint than the traditional campus-based courses, and that is without the inclusion of students’ air travel between countries. The Asia-Pacific Initiative, of which the UNU is a member, is a leading example of a successful global e-learning initiative. Launched at the 2002 World Summit on Sustainable Development by Professor Kimio Uno of Tokyo’s Keio University, the Initiative has evolved to include ten universities in Japan, the US, India, Indonesia, Thailand and Samoa. The two semester-based courses (10 to 15 weeks) currently being offered are Disaster Management and Humanitarian Assistance, and Climate Change, Energy and Food Security. There are currently 297 students enrolled in the 2009/10 fall/winter semester courses. “Moodle is a forum that has been developed to provide interaction between teachers and students beyond limited video conferencing time. This has been useful to know about teachers’ interests and their specialisation. …. 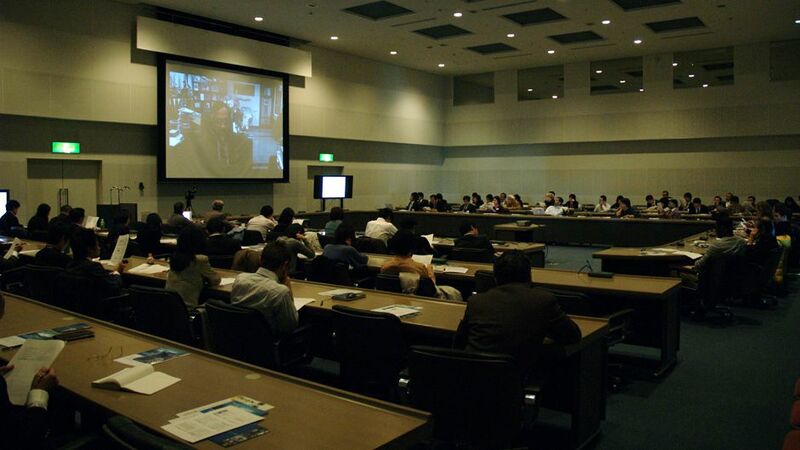 E-learning will play a key role in the UNU’s first ever graduate and PhD learning programs, to be held jointly with universities in Japan and other countries and scheduled to commence in 2010. Admittedly, nothing substitutes for person-to-person contact. But looking into the future, as more and more people seek to fly, with less and less oil to burn in the world pushing up the price of flying, organisations will be under greater financial pressure to cut unnecessary costs, regardless of their response to climate change. The days of travelling across the Atlantic to give a ten minute speech can be put behind us. Connecting across the world through already functional energy and time efficient technologies like video-conferencing makes total sense. When it comes to the education of the next generation — including future leaders who will need to deal with the environmental challenges with which we leave them — a combination of video conferencing and e-learning is a perfect solution. Organisations and communities that build their own capacity to use a variety of e-learning tools will be well positioned for a future world. E-learning Not To Fly by Mark Notaras is licensed under a Creative Commons Attribution-NonCommercial-ShareAlike 3.0 Unported License. Mark Notaras was a writer/editor of Our World 2.0 for the United Nations University (UNU) Media Centre from 2009–2012. He is a former researcher in Peace and Security for the UNU Institute for Sustainability and Peace (UNU-ISP). He holds a Masters in International Affairs (Peace and Conflict Studies) from the Australian National University and the Peace Research Institute, Oslo (PRIO) and in 2013 completed a Rotary Peace Fellowship at Chulalongkorn University in Bangkok. Currently Mark works in Timor-Leste advising local NGOs on community agriculture and conflict prevention projects. – Businesses do look at costs. It is not out of pleasure for oil consumption that they fly people around. I agree that businesses do focus on costs, especially now that we face economic hard ship. It is at these times when companies actually cut back on travel and use alternative cost effective measures like video conferencing. In fact, businesses that do not use video conferencing today are sadly well behind the curve and will fall back even further unless they get their act together. On the benefits of elearning versus face to face, you really have to try it and see. I have been involved in this area for the past ten years and the technology has advanced leaps and bounds. Once you begin to explore alternatives to travel, you find that travelling, especially for educational purposes, seems more of a nuisance than an actual benefit. But I guess this all boils down to personal preferences.